Every grandparent (whether a Boca grandparent or beyond) is looking for ways to spoil their grandchild rotten, am I right? What if I told you that this holiday season, Modern Boca Mom has the exclusive on the gift that will surpass all the rest? 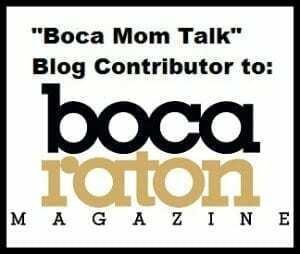 So great, in fact, that Boca moms, dads, and grandchildren can all benefit! It’s not a doll, or a drone, or an adorable outfit that you found at the Town Center Mall. It’s an annual experience that is unsurpassed by anything you could wrap in a box. So what is this magical gift that will put you into the Boca grandparent hall of fame? Consider the gift of “pediatrician-in-your-pocket” healthcare for your very own Boca grandchildren. With an annual membership to Boca VIPediatrics, Grandparents can “gift” both their children AND grandchildren the most priceless present of all…healthcare & sanity! 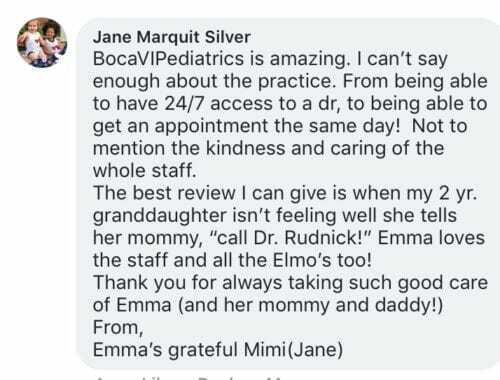 The hallmark of Boca VIPediatrics is the true 24/7/365 access directly to your board-certified pediatrician. That means there’s no after-hours on call service, no nurse triage line. There’s simply a cell phone number that calls or texts right to your pediatrician for questions or concerns anytime they come up. Whether it’s a rash, cough, bump, or bruise, a photo or video can be sent directly to Dr. Rudnick or Dr. Gilbert for a quick diagnosis and treatment plan…24/7. 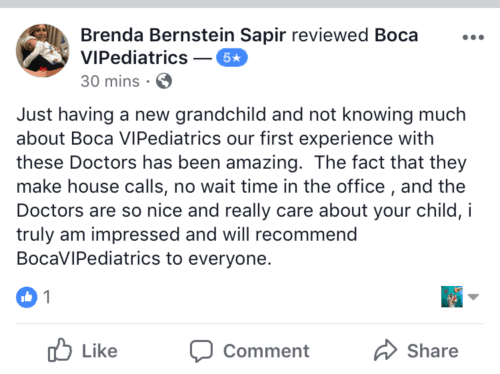 You’ll find an empty “non-waiting room” at the entrance to Boca VIPediatrics, because they only schedule one family per doctor at a time. Instead of your Boca children or grandchildren wasting hours of their day, they’ll be seen on time, every time. 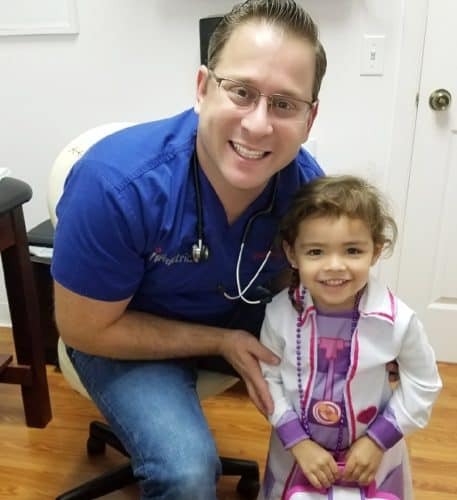 With same day appointments, more time with the doctor, and true “small town care,” this pediatric smart office gives your Boca grandchildren the care and attention they deserve. READ How Young is Too Young to Teach Kids About Business? As a Boca grandparent, we’re sure you remember when doctors used to make house calls. Boca VIPediatrics is bringing them BACK! Dr. Rudnick and Dr. Gilbert make house calls to see newborn babies and also for after-hours urgent care…black bags and all! With the ‘Best of Boca’ Sun Sentinel award to prove it, Dr. Gilbert and Dr. Rudnick trained at some of the top programs in the country (Johns Hopkins and Miami Children’s Hospital) to help earn them the “Best of Boca” title. 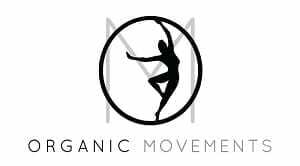 They also have a slew of 5 star reviews on Facebook from parents and grandparents alike…check them out here! Whether your grandkids are staying at your house for the weekend, up at Disney, or anywhere else in the world, they are connected to their pediatrician. 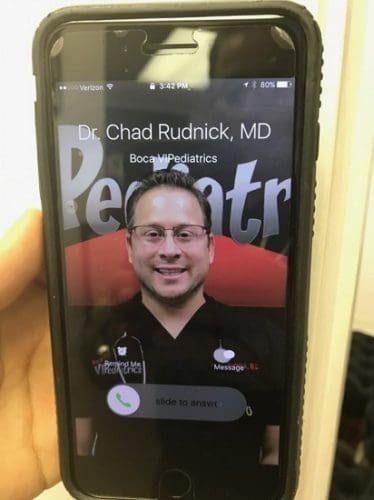 With virtual visits through video chatting, telemedicine products (like a digital stethoscope or otoscope that clip onto your iPhone), and 24/7 access to reach their board-certified pediatrician, their healthcare is always on another level. This membership model of pediatric care is ALL-INCLUSIVE. There are no co-pays and all visits (sick and well) are included. For less than a latte a day, your Boca grandchild can have access to 24/7/365 care whenever they need it. Monthly payment plans are also available! Interested in taking home the “Grandparent of the Year” award by gifting an annual membership to Boca VIPediatrics? 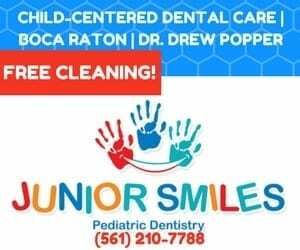 You can learn more by visiting www.BocaVIPediatrics.com or calling (561) 923-9635. Sponsored: This Boca grandparent holiday gift idea post was sponsored by Boca VIPediatrics. All opinions expressed in this blog post are my own and not influenced in any way by the sponsor. Any statistic, quote or other representation about a product or service should be verified with provider. 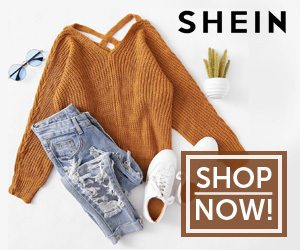 Please refer to this site’s Disclosure for more information. I was compensated for this post, but all opinions are mine.